In the 1970s, our parent company, the Andersen Corporation, changed its approach to manufacturing, developing window products, a supply chain and a manufacturing line to meet the goal of preserving, protecting and extending natural resources. At that time, Andersen developed a window material that combined reclaimed wood fibers and thermoplastic polymers. However, the manufacturing methods and technology back then made making this material inefficient. The Andersen Corporation continued researching and developing in an effort to create the perfect material for windows, which was an important undertaking because between 1968 and 1978 the price of wood increased by 400%. Thanks to this continued research, the Andersen Corporation eventually began using engineered wood and reclaimed wood fibers for its windows, and these materials proved stronger than traditional raw wood. In 1991, the Andersen Corporation finally patented Fibrex®, and in 1995 founded Renewal by Andersen. We now use Fibrex for all of our window frames. As a window contractor, we make our windows ourselves. Here’s how our process works. A Fibrex window frame is made from about 60% polymer and 40% reclaimed wood fiber by weight. To make Fibrex, we begin by heating the reclaimed wood fibers to extract moisture. Next, we heat the polymer to a specific temperature and then combine the polymer with the wood fibers. The polymer and wood fibers then bond at the molecular level to create a new compound. The polymer encases and fills each cell of the wood fiber, and then the wood fibers align and bind together. This makes our Fibrex material moisture-resistant and as strong as wood. We next use an extruder to create Fibrex window frames of all shapes and colors. As an experienced window company, Renewal by Andersen of Eastern NY believes Fibrex is the best material to use for your window frames, and a recent 20-year durability test backs this belief. The study involved installing Renewal by Andersen Fibrex windows in ten Minnesota homes. These replacement windows were exposed to harsh winters and summers over a period of 20 years. Renewal by Andersen chose real windows that they installed for real customers because they’re committed to finding out how our replacement windows perform in real-world conditions. After 20 years, Renewal by Andersen removed the replacement windows and tested them on-site. The results were amazing. After rigorous testing, the 20-year-old windows were found to be in practically the same condition as newly installed windows. There was no warping, moisture penetration or issues with operability. Our Fibrex windows had proven themselves! It’s for this reason that we’re confident enough to include 20-year coverage on our Fibrex window frames and High-Performance™ Low-E4® glass in our Transferable Limited Warranty. The warranty also has a 5-year coverage on workmanship. Our Fibrex windows and their many excellent features are one of the reasons we’re not a typical window contractor or company. The combination of polymer and wood in Fibrex improves our window frames’ durability and structural rigidity, resulting in weather-resistant windows that aren’t affected by moisture, so you won’t have to worry about mildew or mold growth. Our Fibrex frames also won’t expand or contract a lot because of temperature changes. In addition, Fibrex will not corrode, pit, crack, peel, blister, rust or flake, either. As an expert window company, we designed our Fibrex window frames to complement our High-Performance™ Low-E4® glass. Fibrex acts as an excellent insulator, insulating about 700 times better than aluminum. Fibrex window frames also insulate better than vinyl or pine window frames. Our replacement windows can noticeably improve your home’s energy efficiency and comfort. They can help keep your interior cool in summer and warm in winter, while reducing your home’s energy costs by making it easier for your HVAC to maintain your desired indoor temperature. Like vinyl, Fibrex also has minimal maintenance requirements. The colors on your Fibrex window frames won’t fade, and the frames just need an occasional wash with soap and water to maintain their beautiful appearance. This complements the exterior metal oxide coatings on our window glass, which can prevent up to 99% of water spots once the coatings are activated by sunlight. Fibrex is also environmentally friendly and helps conserve our natural resources. Renewal by Andersen manufactures our window frames using reclaimed wood from the Andersen Corporation’s wood window manufacturing facilities. This reuse of wood fibers has prevented the harvesting of over 90 million board feet of lumber. Our Fibrex window frames also help maintain your home’s indoor air quality, as they do not emit any harmful volatile organic compounds (VOCs). Fibrex’s durability and longevity also means our window materials take up less space in landfills because they end up there much less often. 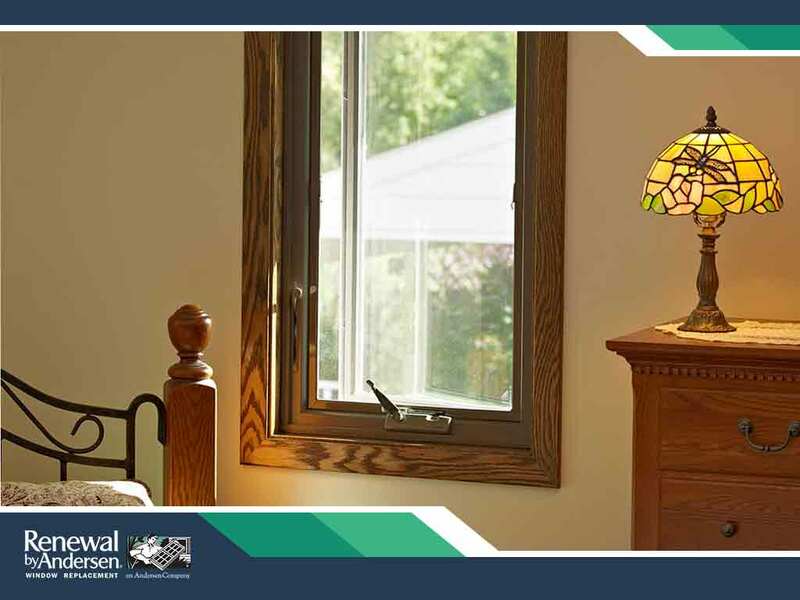 Our replacement windows look great on any kind of home, which is another reason why we stand out from a typical window contractor or company. We can make them in many sizes and shapes, with or without custom grille designs. Our Fibrex window frames also have baked-in neutral colors that look fantastic with any kind of color scheme. There are many reasons to choose neutral colors for your windows. Neutral colors like white, black, canvas or sandstone are timeless, and will still look good decades after we’ve replaced your windows. Neutral colors complement most architectural styles, and also bring the rest of your home’s color palette together. If you plan on updating your home’s exterior colors in the future, you won’t have to worry about changing the color of your Fibrex window frames if you choose a neutral color to begin with. Neutral window colors can even improve the appearance of your interior by making the rest of your interior decor stand out. In addition, neutral colors also help emphasize texture. Our Fibrex material is just one of the things that makes Renewal by Andersen of Eastern NY stand out as a window contractor. Our Start-to-Finish process ensures a successful window replacement, and our window warranties are some of the strongest in the industry. Call us at (866) 479-1700 to learn more about our products and services, or to ask for a free in-home consultation.